LEAD STORY Scientist have taken a photograph of a "Black-hole" which is actually in another galaxy Read Jimmy's report on today's top story, and how this event relates to Bible prophecy. Today on PTIB Jimmy DeYoung has two of his Broadcast Partners that will join him at his Broadcast Table, both with very important reports. Dr Don DeYoung, an Astronomer, will discuss with Jimmy, the recent photo of a "Black-hole", that actually is in another galaxy, how did it get there; what is it; and what can we learn from black-holes. But first, Jimmy will speak with John Rood who has a European Union Up-date, reporting on the reaction of the re-election of the Prime Minister in Israel and then a report on the Brexit situtation. These are two very informative conversations that you don't want to miss. “An OBGYN Doctor Explains Abortion to Congress” – Dr. Levatino Destroys Abortion in 2 Minutes. “What is the relationship of Turkey to Hamas?” – Watch as Dr. Jimmy DeYoung responds to this question on the John Ankerberg Show. “What Role Will Turkey Play in the Biblical End Times?” – Watch as Dr. Jimmy DeYoung responds to this question on the John Ankerberg Show. 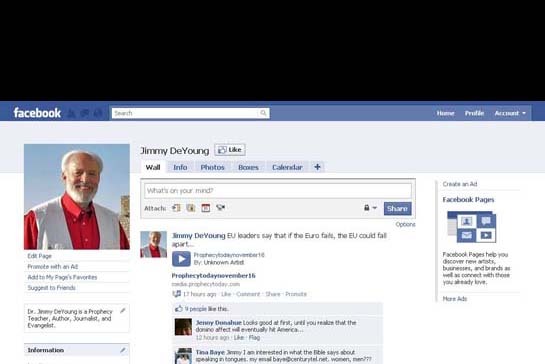 “Why Does Turkey Pose a Danger to Israel, Europe, and America?” – Watch as Dr. Jimmy DeYoung responds to this question on the John Ankerberg Show. “Why is Turkey so Important in Current World Events?” – Watch as Dr. Jimmy DeYoung responds to this question on the John Ankerberg Show. “What should people who do not believe in God do before it is too late?” – Watch as Dr. Jimmy DeYoung responds to this question on the John Ankerberg Show. Is the above player not working? Try this link to Listen live. * Netanyahu Begins Building His Coalition Benjamin Netanyahu has been officially tapped to establish Israel's next government. 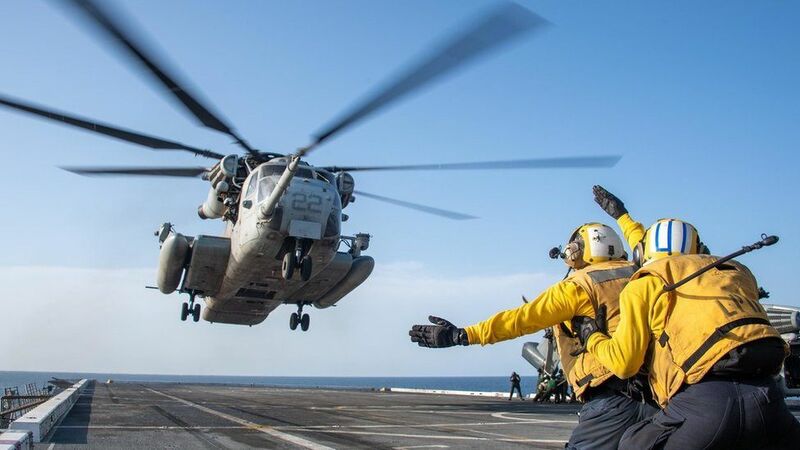 * There Is No End in Sight for Turmoil in the Middle East In this edition of the Interview, Fair Observer talks to Gilbert Achcar, professor of international relations at the School of Oriental and African Studies at the University of London. * Iran's Rouhani Anti-Israel Attack: Urges 'Righteous' Muslim Nations to 'Rid the Region' of 'Zionism' Iranian President Hassan Rouhani used an address at an Army Day parade in Tehran on Thursday to call on "righteous" Muslim countries across the Middle East to unite against Israel and the United States. 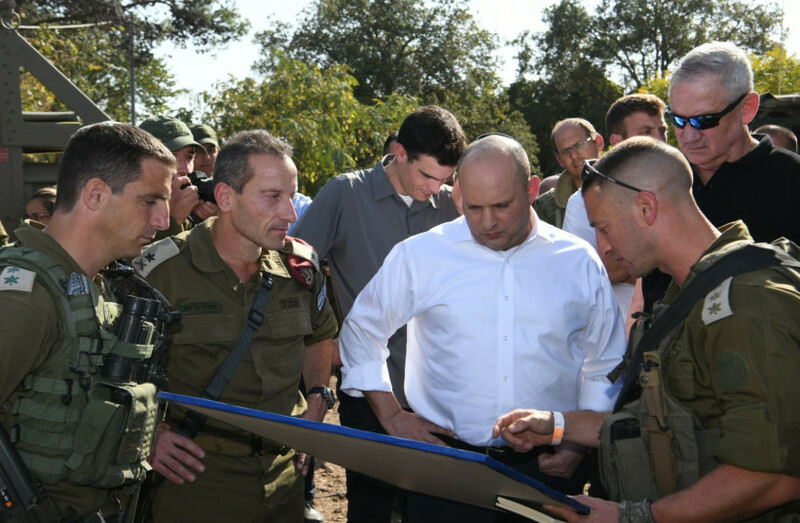 * Israel will win any conflict against enemies to the north, says departing IDF commander General Yoel Strick warns Lebanon will pay for Hezbollah cross-border incursions; threatens Israel will take out Russian S-300 system if used by Syria against IAF warplanes. * Activists, journalists detained over Passover sacrifice attempt at Temple Mount Haaretz editor blasts police for arrests, calls on force to release seized cameras and other equipment. * Hamas & Hizballah set up new March of Return militia on Lebanese-Israeli border The relative calm prevailing on Israel's border with Hamas-ruled Gaza is deceptive. 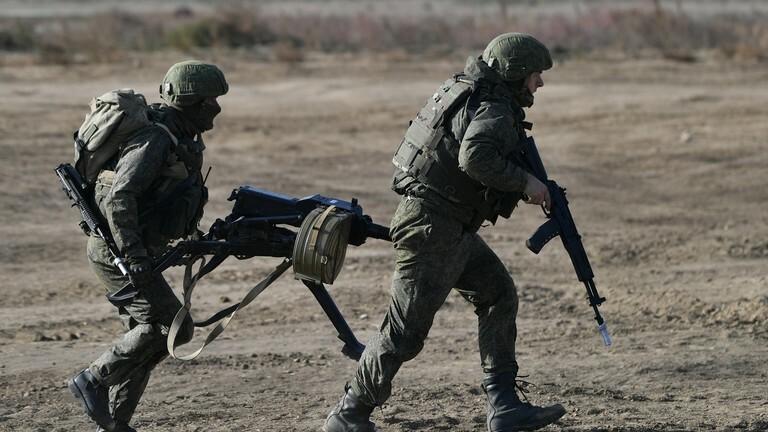 * IDF general: Hezbollah still planning Galilee invasion, despite anti-tunnel op Commander of Ground Forces predicts decisive Israeli victory in a future war with Hezbollah and Lebanon, vows to destroy Syria's Russian-made S-300s if used to repel Israeli raids. * Will Trump be first President to support West Bank Settlement Annexation? Israel has long held that settlement activity is irrelevant to any peace or diplomatic process. * EU leaders look beyond Brexit to Europe's future European Commission chief Jean-Claude Juncker says the European Union can focus unhindered on building its own future now that Britain has a longer delay to work out its exit from the bloc. * Russia envisions a multipolar 'New World Order' as sun sets on America's unipolar moment Russian Foreign Minister Sergey Lavrov has said that new centers of global power are working to build a multipolar system to replace US-led Western hegemony. 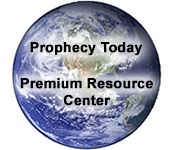 * Prophetic Prospective is Prophecy Today's biblical commentary on the news. * Please note: The starred stories are located outside of Prophecy Today's website. Prophecy Today is not responsible for their content and does not necessarily agree with the views expressed therein. 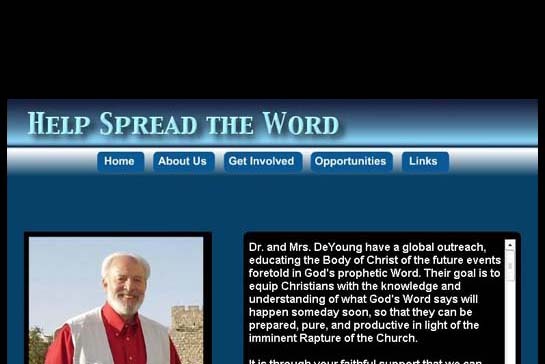 Would you like to partner with Jimmy to help spread the word of Christ's Imminent return? Help Jimmy and store up treasures in Heaven by giving a donation today. 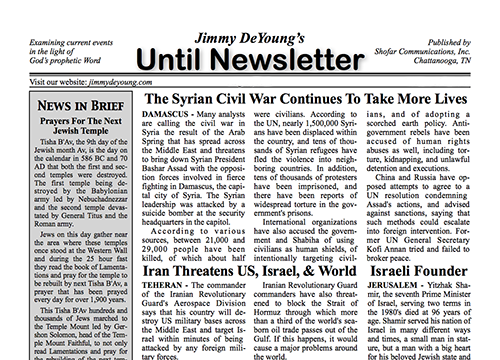 Have you subscribed to Jimmy DeYoung's monthly Until Newsletter? Get 12 issues for only $35 and receive a free CD or DVD of your choice. 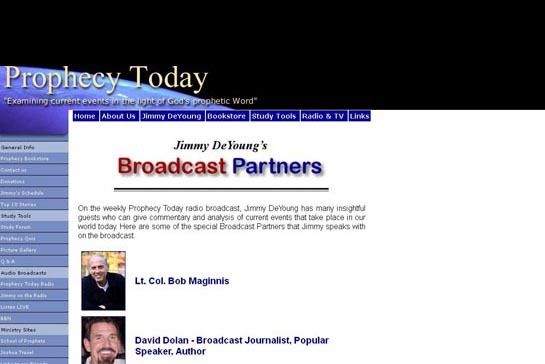 Find out more about the Broadcast Partners Jimmy interviews on Prophecy Today. Do you have a Facebook page? So does Jimmy. Visit him on Facebook and let him know you Like how God is using him to keep us looking up... until.